Alert! An enemy force has infiltrated our lines and has kidnapped (insert important person or enemy prisoner here). They must be stopped before they can get away with their hostage! This is another mission that won't require a great deal of extra terrain from the players. It simulates a hostage rescue or kidnapping of an enemy leader as the kidnapping force tries to reach a per-arranged extraction point. The Attacker gets half of their force (and a hostage model) on-table to try and reach the extraction point objectives. While the Defender gets half of their force on table to try and stop the Attackers from getting past them to those objectives. This represents a search party that has found the Attackers and has called in support from other search teams. While the small kidnapping/rescue force force is trying to reach it's support forces with the Hostage, and get out of the area. The dynamics of the mission should be pretty interesting. The Defender's reserves will start arriving right away from the short table edge behind the Attacker's deployment zone. While the Attacker's reserves are delayed (they start rolling on turn 3) and will arrive from the short table edge behind the Defender. This should force the Attacker to keep moving towards the Defender's deployment zone (and his objective), lest he be caught by the Defender's reserves from behind. While the Defender will want to push towards the Attacker's deployment zone, lest they be caught by the Attacker's reserves. Each player rolls a die. The winner of the roll will be the Attacker. The Attacker then chooses a short table edge to be the Defender's reserve edge. The Attacker's deployment zone will be located next to this edge as shown in the mission diagram above. "You're coming with us Mr. Ambassador. NOW!!!" The Attacker then chooses an appropriate infantry model to represent his Task Force's hostage. This model should be clearly distinct from the other models in his force. If the Defender has extra models available, the Attacker may use one of these to represent the hostage. Next, starting with the Attacker, each player will place one objective in the Defender's deployment zone. Then, starting with the Attacker again, both players will alternate placing 3 point obstacles each, anywhere on the table that is more than 4" from any other terrain feature (excluding bare hills). The Attacker now chooses 1/2 of his Task Force's units (rounded down) to be deployed on the table. The rest will go into delayed reserve (will start rolling on turn 3). 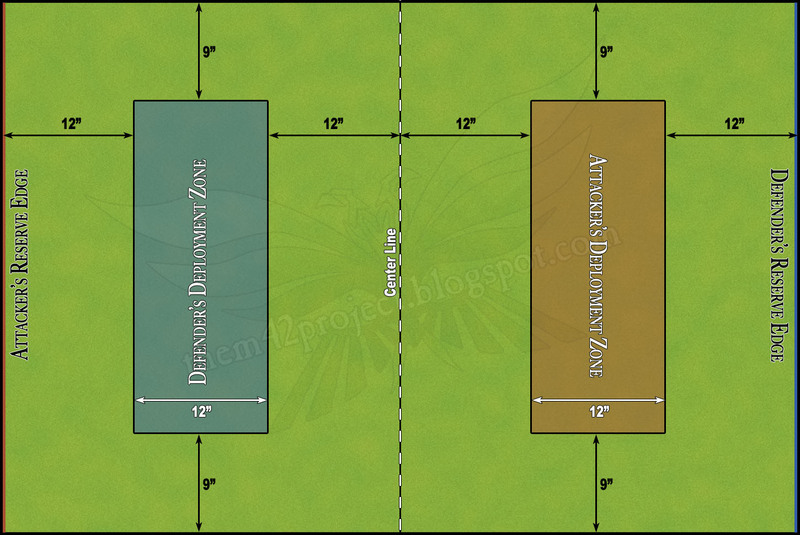 These reserves will enter from the short table edge behind the Defender's deployment zone. The Attacker then deploys all of his units. The hostage model must be attached to one of these units (see 'Moving The Hostage', below). 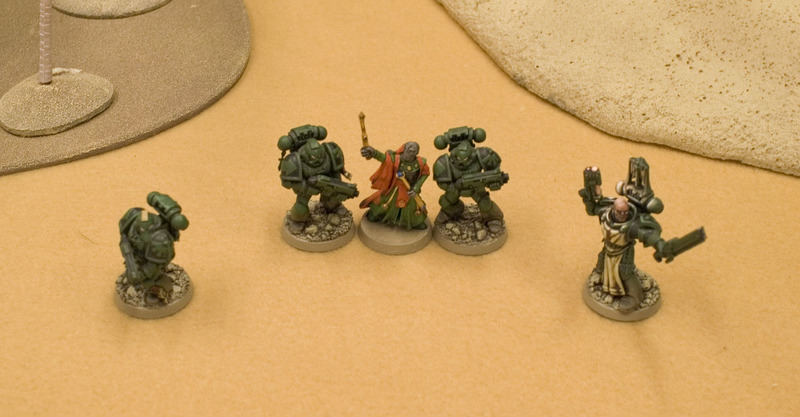 The Defender now chooses half of his Task Force's units (rounded down) to be deployed on the table in his deployment zone. 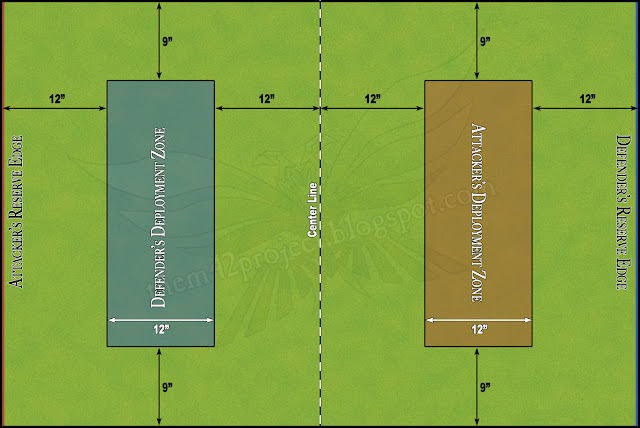 The rest will go into normal reserves (start rolling turn 1), and will enter from the short table edge behind the Attacker's deployment zone. The Defender then deploys all of his units. The Attacker gets the first turn. His objective is to get his prisoner model within 3" of either objective in the Defender's deployment zone, without that objective being contested by the enemy. Only the prisoner model can 'hold' an objective, which represents an extraction point for a skimmer/aircraft to come in and pick him up. If the Hostage model controls either objective at the start of the Attacking player's turn, the Attacker wins. The Defender's objective is to keep the Attacker from getting the Prisoner to one of the objectives for extraction. If, starting with turn 6, the Attacker does not have the prisoner within 36" of the Attacker's reserve edge, the Defender will win the battle. The Defender (or the Attacker) will also win the battle if they kill enough of the Attacker's units to force a Task Force Morale check. If there is no Officer left alive to take the check, then the affected task force will lose automatically as they retreat from the field. There is no turn limit. Play continues until one side or the other achieves it's victory conditions. To move the hostage model, it must be attached to a unit. Either one of the Attacker's units, or one of the Defender's. The hostage is too frightened/injured/weak to move very far on it's own. Or even to know where he should be going. The hostage is considered to be attached to a unit if it's within the Command Radius (6") of the unit's leader. If the hostage is not within the unit leader's Command Radius, then it may not be moved. If the hostage is within the CR or two or more units from the same side, then the hostage may be moved (only once per player turn) by either unit. If the hostage is within the CR of two or more units from opposite sides, then it may not be moved. He simply hugs the ground while the units around him fight it out. Edit: If the hostage is within the CR of two units involved in Close-Combat, then the Hostage will automatically consolidate along with the winner of the combat as if it were a member of the unit. To move the Hostage, simply perform an Advance order with the unit. During an Advance move, the hostage must be placed within the CR of the unit leader, AND must be placed in base-to-base contact with at least one model from that unit. No unit using an Advance order may move more than 6" while carrying the Hostage. To move the Hostage At The Double, the Hostage model must start and end it's move in base-to-base contact with at least 2 models from the unit that it is attached to. No unit using an At The Double order may move more than 12" while carrying the Hostage. Nor may that unit move At The Double if it has any suppression markers. If not directly supervised, the Hostage is likely to run off, hide, or wander away confused. If, at the end of either player's Starting Phase, the hostage is not in base-to-base contact with at least one model from the current either player's Task Force (because that model was killed, for instance), then the opposing player may move the hostage model 6 inches in any direction they choose. Since the Hostage is valuable to both sides, anyone firing in his vicinity is going to be very careful not hit him if they can. All units which fire at a unit containing the Hostage fire as if they are moving (because they're aiming more carefully), even if they are issued an 'Open Fire' order. The unit containing the Hostage may also not be targeted with any blast weapon. Such weapons are simply too indiscriminate to risk hurting the Hostage. Smoke, Stun, and Gas grenades may be used as normal. Well, that's the idea. Does it sound like fun?